As always, the Brits pulled it out the bag for the BAFTA red carpet this year, with standout looks that include Cate Blanchett's custom Christopher Kane creation, Letitia Wright's white Stella McCartney tuxedo and, of course, Kate Middleton's flowing white Alexander McQueen gown. But in true London style, it was the BAFTA after-party looks that stole the limelight last night. Whether it was the Vogue x Tiffany event or Netflix's formal affair, A-listers gathered at a number of shindigs across the capital, clad in their finest dance floor–ready looks. Alexa Chung (who else?) led the best-dressed lineup in an on-trend ankle-length green gown, which she paired with Sophie Bille Brahe earrings and a hair bow. Other highlights include Liv Little's Ganni yellow silken showstopper and Anya Taylor-Joy's Vampire's Wife mini. Scroll down to see the 11 looks we can't get enough of. Style Notes: Alexa packs plenty of new-season action into this look via her green frock, hair bow and pearl earrings. 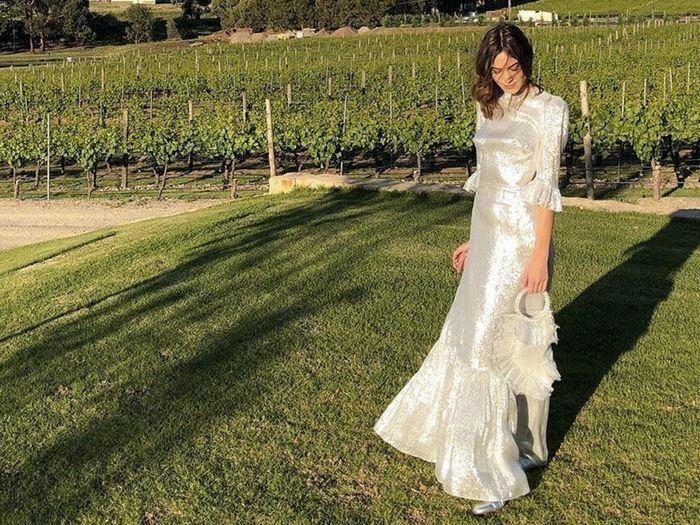 Style Notes: Liv Little gives us goosebumps in this silken Ganni gown, which she styles with a Ganni drawstring bag. Yes, please. Style Notes: Molly Goddard champions her namesake brand in a black, smock-style zip-up dress and perfectly undone hair. Style Notes: Another designer in black, but this time it's Shrimps' Hannah Weiland. Rocking her signature mermaid-like locks, Hannah stays chic with a Shrimps midi dress and beaded bag. Style Notes: This Emilia Wickstead number stands out from the crowd thanks to its clean-lined simplicity and traffic light red hue. Style Notes: Cressida Bonas proves that a trouser suit can have just as much impact as a dress. This Zimmerman two-piece looks fab with her half-up hairdo. Style Notes: We love the minimalistic silhouette and contrasting straps of Zawe Ashton's fuchsia gown. Style Notes: A Vampire's Wife mini is never a bad idea when it comes to party dressing. Anya Taylor-Joy expertly pairs hers with black tights and statement earrings. Style Notes: Jenna Coleman, can we please swap wardrobes? The collar and peplum detailing on this midi dress is perfection. Style Notes: Mossy opts for classic monochromatic hues with a black mini, coat and black tights. As always, she makes it look so easy. Style Notes: Gala Gordon is the epitome of an English rose in this blush-pink AlexaChung dress. Also, kudos for the quirky box-bag accessory and dreamy Tiffany jewellery.